Mika S. and myself had a great week of intensive practice, here in Southern France. We drove down to Gréolières, stopping in the Netherlands for a brief family visit. On Monday the mistral caused wind over the back on every site, so we used it to rest from the long ride. On Tuesday the weather was "on" and we made two long flights locally at Gréolières, doing small out- and returns to the end of the ridge at Coursegoules and small triangles. Especially the afternoon was great, smooth bouyant air, we landed only at half past seven! Wednesday we went to the nearby Col de Bleyne site which is a better starting point for cross-country flying. Mika started early and after a bit of work got very high. Meanwhile local experts were launching and showed us where to fly. I had hoped to fly to St. André but the west wind was far too strong. So after battling that for an hour or so I turned east and flew to Gréolierès and then on the Coursegoules and back to land in Gréolières. Mika returned to Col de Bleyne and fetched our car. 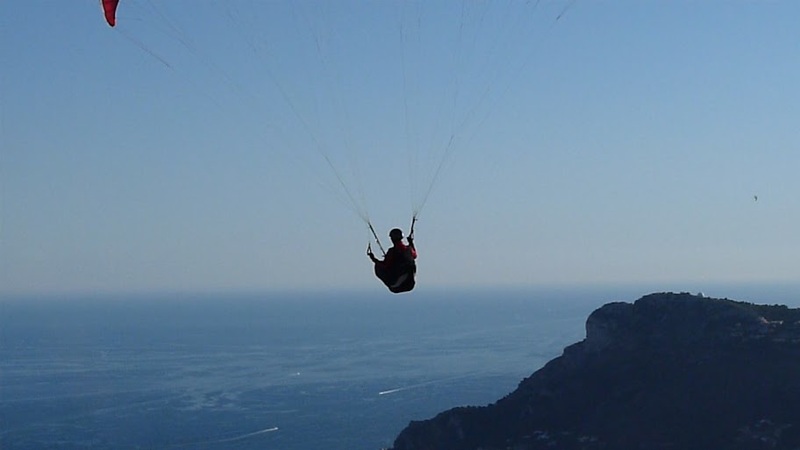 In the afternoon we went to Monaco where Mika made the nice evening glide over Monaco to the beach (in the picture). Thursday was similar, but the predictions were a bit better. The locals were now serious about attempting long flights and took off at 10:30 in what seemed weak conditions. I waited a bit, which probably was a bit of a mistake. This as later the strong north-westerly kicked in and I couldn't get passed the Teillon mountain and had to return. Those that left early got more west earlier and then only had to fight a cross wind, not a head wind. Of course in the late afternoon did another good 2 hours. For Friday the forecast offered some clouds, the whole week had been blue, with a small chance of thunderstorms. Hence I was at the Gréolières launch early to make most of the morning. A southerly wind made for very strong conditions that were truly turbulent above 1500m. When I noted that I stayed a bit low and tried to make some photos of all the pilots in the air; some worked out, and many didn't it. Around noon everybody came down to land. Not so Mika who had been doing some work and only then got to launch. He was joined by two locals and they enjoyed strong, but now less turbulent, conditions and actually managed to fly to Bleyne and back. Mika just returned when I started an afternoon flight. With the thermals now getting slightly weaker again, and a huge cumulus nimbus building over the mountain, the air became a bit more messy again so after an hour we decided to land and go for some ice-cream in Tourettes-sur-Loup.